A highly successful executive in an American Multinational, ThermoFisher Scientific, Mumbai and a gifted bhajan singer, Dr.G.Ramakrishnan (Singapore), is pleased to establish this website to provide Devotional songs to one and all. Dr.G.Ramakrishnan, was born in a small village, Velappaya, in Trissur District in Kerala in the year 1950. He is the youngest of the six children born to (Late) V.S. Ganapathy Iyer and (Late) R.Parvathy Ammal. His childhood and his early life around the Velappaya Sivan temple has had a significant influence on his life. He studied at the primary level at the Velappaya Primary School, middle level at the Manithra School and the secondary level at the St.Thomas High Schools, Thirur (Thrissur Dist), all his school studies have been in Malayalam medium. He lost his father when he was 12 years old ; therefore, he grew up with the support of his mother, brothers and sisters. After finishing his high school in 1965, Dr.G.Ramakrishnan moved to Bombay and stayed with his brother G.Subramanian popularly known as G.S.Mani, who is known for his involvement in social activities. Ramakrishnan studied at the South Indian Education Society (SIES) College in Sion, under the University of Bombay and he received his M.Sc degree in Organic Chemistry in 1971, passing out in first class. Recognizing his potential, the prestigious Bhabha Atomic Research Centre offered him a chance to pursue his Ph.D under Department of Atomic Energy Fellowship and Ramakrishnan earned his Doctorate in Organic Chemistry in the year 1975 from Bombay University. In 1975, Dr.G.Ramakrishnan was selected as Research Associate at the Florida State University’s prestigious Chemistry Department to work with the internationally famous Prof. Werner Herz in Natural Products Chemistry. In 1978 Dr.G.Ramakrishnan left Florida and joined the famous Brown University in Providence, Rhode Island, as Research Associate with yet another well-known Prof. David Cane and worked on the Biosynthesis of Natural Products. Dr.G.Ramakrishnan returned to India at the end of 1979 and joined as a Research Scientist at the ICI Research Centre in Bombay and after two years joined the Sales and Marketing division of Analytical instruments of Hinditron Group of companies. He left for Riyadh, Saudi Arabia in 1985 to head the Scientific and Medical Division of A&MS Kaki company. In 1987 he joined the Forensic Science Laboratory of the Arab Security Studies and Training Center in Riyadh, where he continued till middle of 1990. In 1990, Dr.G.Ramakrishnan moved to Singapore and joined Hewlett-Packard as the Business Development Manager for the Asia Pacific Region. In 1995, he was naturalized as a Singapore citizen. In 1999 he was transferred to India to head the Life Sciences and Chemical Analysis of Agilent Technologies (offshoot of Hewlett-Packard), where he worked till October 2004 as Vice President. In November, 2004, he joined Thermo Electron Corporation as the Director of Scientific Instrument Division. Presently this company is known as Thermo Fisher Scientific and Dr. Ramakrishnan is presently the Managing Director of this company. "My roots are in the Indian classical music. My parents were good singers and the musical atmosphere at home only kindled my fondness for music. The music of the streams and rivers, the melody of the Vedic renditions from the Sivan temple in Velappaya, the inspiring and lilting bhajans that wafted through the air...all created a penchant for music in me.” Dr.G.Ramakrishnan has had no formal education in music but he has been singing in his schools even when he was a small boy. He received his first prize in music at the age of 12 for the song “Manasa Sancharare’ that he sang in his village. Music has always been an integral part of his life as was academics and he actively took part in music during his college days and regularly performed at the college annual days. Frequent visits to music performances with his brother G.S.Mani, who has a good knowledge of Carnatic Music added to his understanding of music. His keen interest in music got revived in the 1980s, and he started singing Bhajans in Bombay. The blends of music in his breathe and bhakthi in his heart paved the way for the evolution of the lyricist within him. 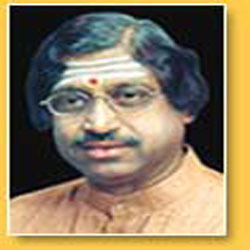 Dr.Ramakrishnan started writing lyrics and composed the same. Due to the heavy demand of time on his job as the top executive of the MNC, he has been going slow in his music activities. One of Dr.G.Ramakrishnan’s most recent project is an album of 10 Ayyappa songs that has received tremendous appreciation from all quarters. He has recently recorded 14 more songs. He is planning to record more of his songs in the next album, which will be more of Krishna songs. The sole objective of setting his personal website, “Bhakthi Githanjali” is to share his own songs and bhajans freely with all those, who are interested, and also to revive some of the old yet wonderful devotional songs and bhajans. He owes his interest in music and bhajans especially to 3 great singers, Dr. Balamurali Krishna, Dr. K.J.Yesudas and Shri. Pithukuli Murugadas. Dr.G.Ramakrishnan's gifts of time, treasure and talent have earned him, over the years, the reputation of being a great humanitarian amongst the vast fraternity of his friends. "I'll never forget where I came from, nor the people who helped my family or me along the way". For this reason, Dr.G.Ramakrishnan will often lend a hand or his name in support of causes that he believes are important. He is also very grateful to his wife Lata and sons Ganesh and Girish, who have been always a source of inspiration and support. © 2011 bhakthi-gitanjali.com | All rights reserved.